Adversity is a gift, and D Kingsley of Mangalagiri village in Thoothukudi knows it too well. In 2016-17, when the entire state of Tamil Nadu was reeling from the worst drought in a century, arranging fodder for his 15 cows had become a struggle for Kingsley. “That’s when I decided to grow hydroponic maize,” he says. The technology involves growing plants without soil and by using mineral nutrients dissolved in water. For setting up the unit, Kingsley procured 16 plastic troughs from Krishi Vigyan Kendra (KVK) at the district headquarters, filled those with nutrient-rich water and sprinkled sprouted maize seeds over it. Within 10 days, the seedlings grew into 30-cm -tall plants with tender corns, and were ready to be harvested. The instant maize is one of the 200-odd alternatives that the Indian Council of Agricultural Research (ICAR), New Delhi, and Indian Grassland and Fodder Research Institute (IGFRI), Jhansi, have developed over 50 years under the All India Coordinated Research Project (AICRP) on Forage Crops and Utilization. 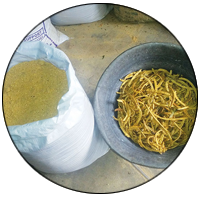 While most innovations aim at improving productivity and nutritive value of forage crops, some are being promoted by KVKs for their advantages in areas grappling with water and fodder scarcity. Just a few kilometres from Mangalagiri, farmers of Vilathikulam taluka were caught in a vicious cycle created by mesquite, a shrub under the genus Prosopis. The plant, notorious for depleting groundwater by spreading its roots deep into the soil, was spreading fast in the coastal region. “Cows are fond of the ripened mesquite pods. 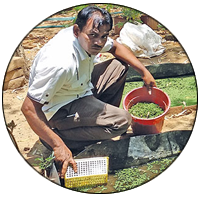 But they cannot digest its hardy seeds, which then gets released through the dung and aid in propagation of the weed,” says V Srinivasan, senior scientist at Thoothukudi KVK. In 2007, scientists at the KVK came up with a solution to end the vicious cycle. They ground the ripened mesquite pods and offered the flour as cattle feed. “My cows produce half-a-litre more milk since I have started feeding them mesquite pod flour. The milk is also thicker,” says M Madasamy, a farmer from the taluka. In fact, mesquite now provides additional income to Mada samy. Every day, he collects pods and supplies to a local mill owner for Rs 6 per kg. “Most farmers in the district now buy mesquite pod flour, which costs Rs 16 a kg against wheat and pearl millet bran that costs Rs 22,” says Srinivasan. Elsewhere, scientists are experimenting with forage crops that have helped other countries tide over fodder shortage. One such is thornless cactus. 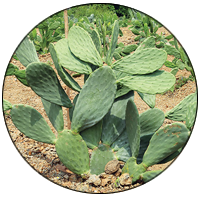 In 2015, BAIF Development Research Foundation, a Pune-based non-profit that works as a research centre under the project, initiated a project to standardise the production technology of thornless cactus so that it can be grown as fodder in arid and semi-arid regions. “The cactus is a good source of water for animals. After consuming 40 kg of fresh cactus, a cow will drink 35 litres less water,” says Vitthal K Kauthale of BAIF. The non-profit has developed a hybrid of pearl millet and napier grass, which grows fast and has soft, succulent leaves. “The variety, named BAIF Napier hybrid-10, has gained popularity among dairy farmers,” says Pramod S Takawale of BAIF. In 1970, when ICAR launched the project, its aim was to “boost forage production in diverse agro-ecological regions”. But the gap continues to persist even half-a-century later. IGFRI data shows the country faces 63.5 per cent fodder deficit. To tide over the shortage, Indian feed industry has demanded the import of distillers dried grains with solubles, a byproduct of ethanol produced from corn, from USA. Officials associated with the project blame the continued deficit on various other factors. “In recent years, there has been more emphasis on high yielding cattle breeds, which require more fodder than the indigenous ones,” says Srinivasan. A K Roy, project coordinator, AICRP on forage crops, blames lack of storage and transportation facilities for the deficit. Climate change is also playing spoilsport. With rains becoming erratic, many regions are suffering from unprecedented floods and droughts, which affect fodder availability, he says. Farmers say alternatives under the project have largely failed to make an impact on the ground. Kingsley says hydroponics is an expensive techno logy. He spent Rs 25,000 for setting up one unit, which yielded 8 kg of maize after 12 days. This is when a cow needs 15-30 kg maize a day. “The seeds I received in the second round failed to germinate,” he says. Though he has been compensated for the losses under Drought Prone Area Programme, he vouches not to take up hydroponic maize again. Srinivasan says there is a need to train all farmers on novel forage crops and technologies. But KVKS do not have enough funds for mass promotion or training for farmers. It grows in ponds, ditches, paddy fields, and contains 19-30 per cent more protein than most forage crops. It can be fed to livestock fresh or dried. It is being promoted in Karnataka, Tamil Nadu and Punjab. Limitation: Highly perishable. The shrub thrives in arid and semi-arid regions. With 12 per cent protein, 15 per cent free sugar, its pods can replace grain brans. It is being promoted in Rajasthan and Tamil Nadu. Limitation: The shrub is a water guzzler. It grows in poor soil. Moisture content eliminates providing regular water to the cattle. It's being promoted in Andhra Pradesh, Maharashtra, Gujarat, Rajasthan, Karnataka and Uttarakhand. Limitation: In experimental stage. 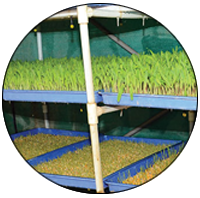 Crops can be grown in troughs using water and nutrients; harvested in less than two weeks. It is being promoted in Tamil Nadu, Gujarat , Maharashtra and Chhattisgarh. Limitation: Expensive; only grows maize.